Recently we posted an article regarding the best standing desks for tall people and it has now become our most popular and most read article. For us it was a bit of a surprise, we didn’t realize that so many people would be struggling to find not only a standing desk but even a regular tall desk to fit their body type. Most offices have pretty standard size desks, and unfortunately, human beings are anything but standard sizes themselves! More often than not, you’re going to have problems with the height of your desk. 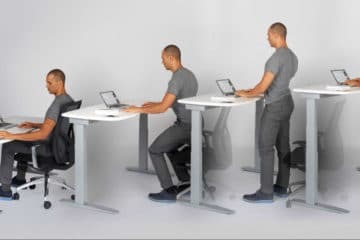 Well, often people are searching for the best tall desk or the best short desk without actually knowing what the ergonomically correct desk height that is best for your posture. Obviously, most people know you have to sit or stand up straight, you should look straight ahead and not down, or you should keep your feet flat on the floor, but that doesn’t really help if you’re buying a desk online. We wanted to provide some facts and figures so you can get as close as possible to your ergonomically correct desk, and have a workstation that is inch perfect. So here we are, starting from the beginning. If you work in an office or have bought a desk for your home at any point, you’ll probably notice that in general, all desks come in the same size. In fact, the industry standard for desks is 29 inches tall, or 73.5 cm (approximately). It is curious that this has become the standard, as this would be an ideal height for people 6 feet tall, which according to the National Center for Health Statistics, is far from the average American person’s height. According to the link above, the average American man is 5 feet 9.2 inches tall, and the average American woman is 5 feet 3.7 inches tall. So really, most people are dealing with an office desk that is far too tall for them. And of course, there are also plenty of people over 6 feet tall who, for ergonomic reasons, need a much taller office desk. Basically, only the minor percentage of men and woman who are 6 feet tall (or near enough) will be sitting comfortably at their office desks. The 99% of the world will be sitting sub-optimally, and in the long run, harming their bodies. Below we have provided a simple table in both feet and inches, and in centimeters, to help you find the optimal office desk for your height. 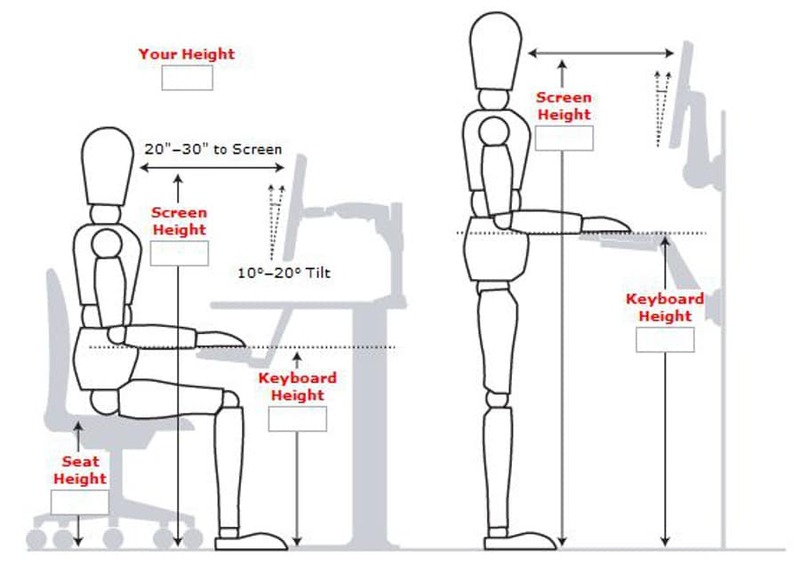 Additionally, we have included the optimal height for standing desks and the optimal height for your office chair. Remember that when using this table to also take into account your shoes (this could add an inch to your standing height as well as affect your optimal chair height) and also if you use a standing mat. Everyone is different, some people have longer torsos, some longer legs, other short arms…you get the point. For this reason, these measurements are a guideline to get you started. The only real way to know the exact number is measuring for yourself how tall your desk and chair need to be. DO NOT MISS: If you are tall and looking for an ergonomic desk we have the best tall standing desks in 2019 right here! Firstly, our apologies for such a long table! In saying that, we wanted to include as many people as possible into these measurements, so we extrapolated the height ranges from 5 ft to 6 ft 11, covering 95% of the population. To help you visualize the numbers in the table a little better, let’s take another look at that first image again. As you can see, the standard desk height of 29 inches fits someone of around 6 feet tall. Now we believe that you don’t have to be accurate to the smallest degree, in fact, many websites will give you slightly different numbers when it comes to the best height. As we said before, it depends on the individual and what feels comfortable to you. In saying this, you should try stick within a 1 to 2-inch range of your actual height. As a rule of thumb, for every 1-inch difference in height you are from 6 feet, add or remove 0.4 inches to the industry standard of 29 inches. e.g. If you are 6 ft 3 in, you need to add 3 x 0.4 to 29, which equals 30.2 inches. If you are to buy a standing desk, much better to go with an adjustable standing desk as opposed to non-adjustable. This way you will have full control of the desk height. As you can see in the illustration, the arms are at a 90-degree angle on the desktop, and the monitor is raised up to eye-level. There is no real industry standard for standing desks, although fixed standing desks like the ones from Varidesk have a height of 47 inches. Instead, adjustable standing desks have a range of heights, so as long as you fit within that range you will be ok.
For standing desk converters this requires a small calculation. Remember we said that the average desk height was 29 inches. Well, you’ll need to add this to the standing desk converter height range because a standing desk converter sits on top of your existing desk. QUICK TIP: If you want the flexibilty of having both a normal desk and a standing desk, take a look at some of these desk converters. Often overlooked is the ergonomically correct chair height. We have added that to our table so you can see more or less where you need to be. Another rule of thumb, both your hips and your knees should be near a 90-degree angle, with your feet flat on the ground. In this position, you will be most comfortable and put the least amount of stress on your joints. For more information about ergonomic chairs, take a look at our office chair buying guide. There is nothing better than having your desk set up to suit you and fit your needs. Spend a bit of time and get out the measuring tape to make sure you are getting the most from your office desk. Whether you are standing or sitting, it’s nice to have an adjustable desk. No more back pain, sore neck, or tight shoulders. Follow the table above for a general idea of what height chair, desk, or standing desk you need, and for best results get someone to help you make sure you are sitting properly. Biddle SJ, Gorely T, Marshall SJ, Murdey I, Cameron N. Physical activity and sedentary behaviours in youth: issues and controversies. J R Soc Promot Health. 2004 Jan;124(1):29-33. This article was reviewed and approved by Dr. Marija Petkovic.